Jay Farrar still can’t say Jeff Tweedy’s name | Will You Miss Me When I'm Gone? His prose, like his songs, is a touch too serious, and at times the book seems stiff. But it’s clearly Jay’s voice. There’s no question in my mind he wrote this without the help of a ghostwriter. The anecdotes, about his early interest in music, his mom and dad (Pops Farrar) and other family members, seem authentic. But they’re a bit sterile at the same time, almost as if he’s written a book to satisfy the fans and others who want to get a piece of him without actually surrendering his inner self. While it’s a little curious, it seems consistent with the Jay I met when I interviewed him on the earliest days of Son Volt — a friendly and honest, but cautious and extremely private, guy. So if you turn to the book for major insights, revelations and serious dirt, you’ll be disappointed. In fact, if you’re interested in knowing what Jay thinks about his music, how he makes it or what motivates him to create it, you’ll be unsatisfied, too. Even so, the stories he tells of growing up in a relatively poor family in the Midwest says a lot about why he became the man he is. I have to admit that Jeff Tweedy was the reason I picked up the book. I wanted, finally, to know how Jay felt about his longtime friend and cofounder in Uncle Tupelo, who took most of Tupelo’s members with him to create the extremely popular Wilco. He mentions the band by name for the first time nearly halfway through the book, and only twice more after that. The junkyard-ethos era with my father continued on through my early twenties, till I had enough money to buy a car outside of the salvage realm. I was in a touring band then, in the early 1990s. The last junkyard sojourn with my father was on the same day I left that touring band for the second time. The first time was when the bass player woke up my girlfriend, who was sleeping on the back equipment van bench, to profess his love for her while I was in charge of driving up front. The reason for leaving the band the aforementioned second time was for artistic and band direction differences of opinion. I spoke the words, “I have the desire to be your friend. It’s just not possible in the context of this band.” The bass player responded with belligerent vitriol. I walked away … Even then I was aware that nothing in the world could be more pathetic than two guys throwing punches in the early afternoon in a decrepit apartment on Eleventh Street in Belleville, Illinois. I have to admit that I was on Team Jay after the breakup. He struck me as the more mature and genuine artist of the two, someone interested in making something more than just party music. And Jeff’s legendarily bad treatment of members of Wilco, including Jay Bennett, pushed me further into Jay’s corner. made it easy for me to dismiss him for awhile. My opinion of Jeff has changed as he grew as an artist and got his head on straighter and his demons under some semblance of control. Wilco’s Solid Sound Festival, every edition of which I’ve attended over the last four years, did a lot to bolster Jeff’s image in my mind. While I’m still on Team Jay, I’ve become very open to Jeff and see him as equally brilliant — and obviously more successful, whatever that means. In the end, Jay’s book really seems to show that he hasn’t grown as much as Jeff. And, I think, until he comes to grips with his feelings a bit more directly, Jay’s art, sadly, will always take a backseat to Jeff’s. 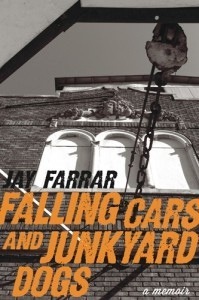 This entry was posted in Books, Country, Folk, Music, Pop and Rock, Recordings and tagged Falling Cars and Junkyard Dogs, Jay Bennett, Jay Farrar, Jeff Tweedy, MASS MoCA, Massachusetts Museum of Contemporary Art, North Adams, Pops Farrar, Solid Sound Festival, Son Volt, Uncle Tupelo, Wilco. Bookmark the permalink. Whether he meant it or not, those lines reflect Farrar’s own musical journey, which has remained committed to his traditionalist roots. Obsessives of Uncle Tupelo, a band more famous now than during its active years, will likely seek out this book for crumbs explaining Farrar’s split with co-founder Jeff Tweedy, who went on to front Wilco. Jay Bennett didn’t commit suicide. His death was an accidental overdose of a painkiller delivered by a patch that was on his body at the time of death. Thanks for pointing this out. His death was not declared a suicide. I apologize for the misstatement. The post has been updated. I don’t need Jay to be as balanced or to have matured as much as Jeff, on a selfish, music fan level. I need him to deliver soul-searching grit.